It’s likely that you haven’t yet heard of Reconnective Healing® or The Reconnection®. Unlike other health modalities, Reconnective Healing® is relatively new, having only been discovered in 1993 by Los Angeles based Chiropractor Eric Pearl. Since 1993 there has been a worldwide explosion in the number of people experiencing these new healing frequencies. Read on for a simple explanation of how Reconnective Healing® works and what to expect. The human body is designed with in-built intelligence to heal itself. We’ve all witnessed how effortlessly the body self-heals from a simple cut or a bruise. Sometimes, however, the daily stresses of life bombard us with interference that overwhelms and compromises the body’s self-healing mechanisms. Interference may be caused by the cumulative effect of any number of factors – such as ongoing stress, poor nutrition, self-destructive behaviors, or environmental toxins. When the body is overwhelmed, it may need an “injection” of outside stimulus that helps return the body to balance. This injection can take many forms – a pharmaceutical remedy providing the body with a missing chemical compound; vitamins and supplements replenishing the nutrients the body is lacking; acupuncture treatments or chiropractic that unblock the system’s energy flow; or a lifestyle change that infuses one’s days with comfort and ease. Some of these “injections” are more familiar to us than others, and some make more sense to us than others, given our education and culture, but they all are effective treatment options – different paths leading to the same destination of health and wellness. In the case of pharmaceuticals or supplements, the matter is straightforward: Replace the missing substance, and the body process will return to normal. In the case of the mind-body-spirit forms of healing, however, the approach is less about adding the missing puzzle piece and more about facilitating an overall state of wellness. The basic idea here is that illness is dis-ease – a state of imbalance or dissonance in the body; so when we activate a state of balance and harmony, the illness naturally will fade away. There are a wide range of holistic treatment options available for bringing the mind, body, and spirit into balance – yoga, tai chi, qi gong, chiropractic, acupuncture, cranio-sacral therapy, reflexology, massage, and so on. Some of these therapies are movement-based; others are touch-based; and still others are energy-based. Regardless, all of these therapies operate on the basic principle that through creating the optimal conditions for the mind, body, and spirit to come back into alignment, imbalances will self-correct, and the body will self-heal. The Reconnection® shares the basic objective of returning the body to balance. It distinguishes itself from these other modalities, however, by circumventing the poses, needles, meridians, and techniques, and instead directly taps into the universal healing intelligence – that same intelligence that enables the body to self-heal from a cut. We can tap into the universal healing intelligence the same way that we can tap into sound, light, and electricity – through accessing and transmitting the vibrations emitted. The first step to accessing a force field is recognizing that it exists all around us. The next step is identifying, designing, and building the transmission instrument. In the case of sound, we have the radio. In the case of light, we have solar power systems. In the case of electricity, we have plugs and outlets. And in the case of universal healing intelligence, we have ourselves and each other. When it comes to universal healing intelligence, we – human beings – are the transmission instrument. There is nothing to design or build, just something to cultivate. Brought up in a world of reading, writing, and arithmetic, we are not typically skilled at recognizing, never mind transmitting, healing vibrations. We are, however, equipped to do so. The Reconnection® is the activation of a human being’s innate ability to serve as an instrument of healing, to access a shift in consciousness that allows us to recognize, feel, absorb, and transmit an expanded level of the universal healing intelligence. The specific frequencies utilized in The Reconnection® were first accessed by Dr. Eric Pearl, when he was practicing as a chiropractor. At the cajoling of his assistant, Dr. Pearl met with an intuitive who said she could reconnect Dr. Pearl’s meridian lines to the grid lines on the planet. These grid lines, she claimed, in turn, connect human beings to the stars, planets and other dimensions of the universe. Highly skeptical but intrigued nonetheless, Dr. Pearl took the bait and had a session. From that day on, Dr. Pearl’s chiropractic patients began reporting dramatic healings unrelated to chiropractic, simply when Dr. Pearl held his hands near them. Seeking to understand what was happening, Dr. Pearl consulted first with the intuitive and next with leaders in science, medicine, and spirituality – discovering that nobody had the answers for what was going on. Ultimately, not knowing what was happening enabled Dr. Pearl to step out of the driver’s seat and serve as a receptive conduit – more accurately, a catalyst – for the healings coming through him. In this state of openness, Dr. Pearl began to understand that we have the greatest chance of healing and being healed, when we have no preconceived notions or expectations. By simply opening to the universal intelligence and allowing the healing frequencies to come through, people can receive what they need instead of merely what we think they should have. Sometimes people receive a healing for the problem they are addressing, and sometimes they receive a healing for an unrelated problem. Sometimes they notice just the physical healing, when in actuality they may be receiving an emotional, spiritual and mental healing as well. Sometimes the change is not apparent for weeks or months, and on occasion the person does not notice a change at all. Based on reports from healing recipients around the world, however, the healings appear to be fairly instantaneous and permanent. 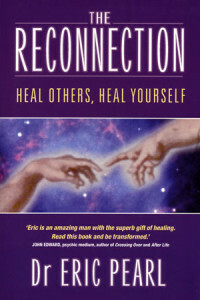 The Reconnection is never about directing, manipulating, or otherwise attempting to force a healing. It is simply about opening the door for an individual to access and receive that which comes through – a healing uniquely customized by the intelligence of the universe. Over time, Dr. Pearl learned that he not only was able to facilitate extraordinary healings, but that he also was able to teach others how to facilitate these healings. And so The Reconnection® organization was born – through which Dr. Pearl has traveled the world and trained an estimated 75,000 practitioners internationally. Are you ready to experience The Reconnection® for yourself? You can book in for Reconnective Healing® sessions and The Reconnection® on the Work with Me page.